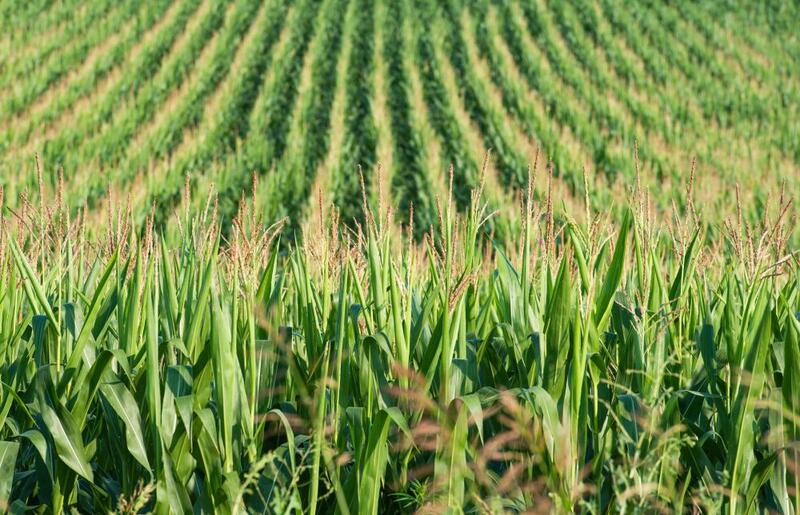 A field of corn will transpire between 3,000 and 4,000 gallons of water a day. The main purpose of transpiration is to open the stoma, allowing carbon dioxide to diffuse into the air, which is a primary function of photosynthesis. Transpiration is the process of water evaporating through stoma, or pores, in the foliage of plants. 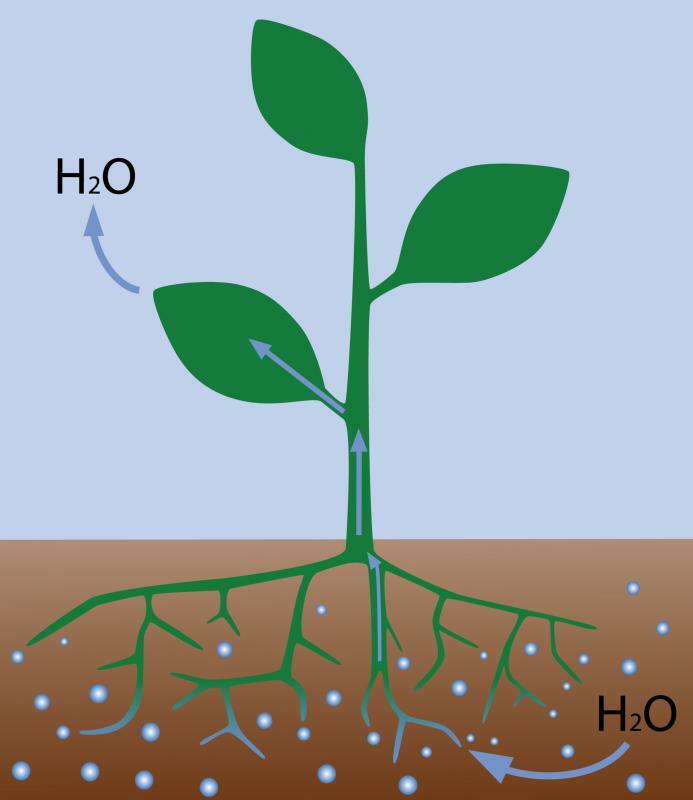 The water travels from the roots where it is absorbed, up through the stem, and exits as vapor from tiny holes on the bottom of the plant's leaves. This process can be detrimental to plants, especially when the amount of water available is low, but it is vital to producing food. About 10% of the water in the atmosphere is produced in this way, while the other 90% is a result of evaporation. The main purpose of transpiration is to open the stoma, allowing carbon dioxide to diffuse into the air, which is a primary function of photosynthesis. The fluid that is released occurs as a side effect. The water pressure in the leaves of the plant is considerably lower than that in the roots, causing it to move upwards. The water is rich in nutrients and is combined with sunlight and carbon dioxide in the leaves. 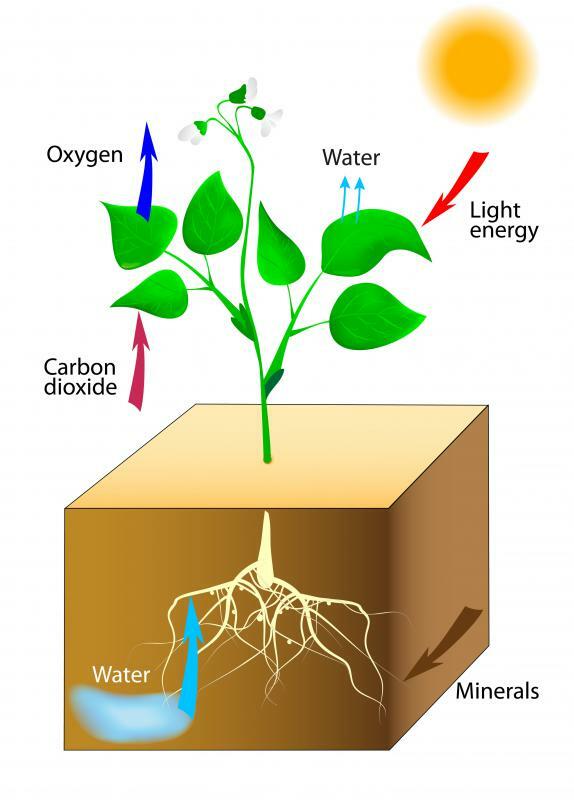 This creates food for the plant, and the stoma in the leaves then open, allowing the remaining water and carbon dioxide to be released into the atmosphere. An average oak tree will release about 40,000 gallons (151,416 liters) of water per year, while a field of corn will transpire between 3,000 and 4,000 gallons (11,356 and 15,141 liters) of water a day. Other plants, especially desert natives, are adapted to reduce the amount of moisture they release, in an effort to conserve water. Cacti perform photosynthesis in their stems, resulting in a relatively low number of stoma. Other plants specialized to reduce water loss have a special form of photosynthesis that causes the stoma to close during the hot day, when the water is needed most, and open at night, when the amount of water transpired will be lower. Leaves cannot transpire when the humidity of the air directly surrounding the stoma is high. When the air is already saturated with water, more water cannot diffuse through the pores of the plant, as it has no where to go. Wind also plays a vital role in transpiration. As the air around the stoma becomes saturated with water, the wind blows it away, and it is replaced with drier air, which can hold additional water, allowing the plant to transpire. Temperature also affects the rate at which the release of water occurs. When the air is warmer, the stoma open, allowing the plant to transpire more. During cold weather, the stoma remain closed, and do not release as much water. The growing season occurs during the warmer months, because photosynthesis can take place more often, as the stoma are open for longer periods of time and more food can be created. Plants often go dormant during winter, due to the colder temperatures and prolonged closing of the stoma. How can I Lose Water Weight?